After an early September stop in Podgorica, Montenegro, Electronic Beats will touch down in Bucharest, Romania for a two-day festival on October 2 and 3. We’re bringing DJ Hell, Totally Enormous Extinct Dinosaurs, Actress, Hudson Mohawke and more to four venues around the city, but we haven’t totally completed the lineup yet. In fact, we’ve left a spot open on purpose, and we’re hosting a DJ mix contest to decide who should fill it. 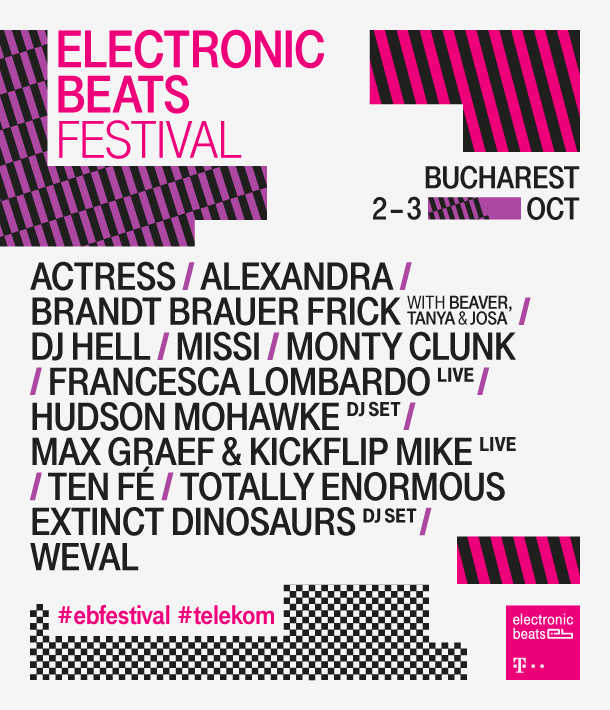 To enter, post your own DJ mix to the EB Festival Bucharest Facebook event page by September 23 and invite your friends and admirers to like the post. Genres considered will be Deep House, Tech House, Minimal, Techno and similar. The 15 entries with the most likes will be sent to a panel of music critics, event organizers and bookers who will rate each entry based on technical skill, overall mood, creativity and track selection. We’ll announce the winners by September 25, 2015 in this article and on our Facebook. Entrants must be 18 years of age or older. In addition to winning playtime at the festival, the winner will receive a Native Instruments Z2 Traktor Kontrol mixer and two Native Instruments Traktor Kontrol D2 controllers. We’ll also be hosting a special edition of Native Sessions, the Native Instruments series of global live learning events and music workshops, where you can explore new gear and audio formats. Check out the full details here! EB Festival Bucharest 2015 kicks off at Atelierul De Productie at 20:00 with a performance by TMTS Britpop heartthrobs Ten Fé, who will also appear at our festival in Podgorica. The UK duo won us over with their combination of washed-out electronics and updated Britpop, and they have an album in the works with Ewan Pearson. They’ll share the lineup with Francesca Lombardo, a London-based DJ who recently released on heavyweight indie house label Crosstown Rebels, and Brandt Brauer Frick, a live techno band out of Berlin who use classical instruments to make club-oriented body music. They’ll play that night with an extended live ensemble. Later on that evening, we’ll be at the Guesthouse at midnight with some outstanding DJ talent in tow. Kompakt-affiliated Dutch duo Weval will play before legendary Bavarian selector and International Deejay Gigolo label boss DJ Hell (aka Helmut Geier). His importance in the history of German dance music cannot be understated, as he was one of the first DJs to play house back in 1985 and released classic records from Chicago house pioneers like Bobby Konders and DJ Pierre. The festivities on October 3 start at midnight on Studio Martin with MissI, who will open for Berlin golden boy Max Graef and neo-rave revivalist Totally Enormous Extinct Dinosaurs (TEED). Graef, a house and hip-hop head native to the German capital, charmed many last year with the release of his debut album, Rivers of the Red Planet. Although his lively DJ sets have moved bodies at Panorama Bar and beyond, he wants to try something new at our festival: a live set. He’s enlisted one of the guys from his Box Aus Holz label, Kickflip Mike, to join him before TEED DJs. TEED, like fellow past EB Festival performers Disclosure, broke out via the Greco-Roman label, and has since brought his saccharine sounds to the masses with releases on big and major labels including Crosstown Rebels, Mad Decent, Polydor and Universal. The heaviest lineup is arguably that of the closing event, which starts at Control at 1:00. After a warmup set from Monty Clunk, we’re handing the controls over to experimental techno visionary Actress and hip-hop/dubstep luminary Hudson Mohawke. Actress recently submitted an enchanting contribution to !K7’s longstanding DJ-Kicks series and has provided some of the most compelling avant-techno in recent memory with albums on Honest Jon’s, Ninja Tune and his own Werkdiscs label. Read his conversation with experimental techno icon Mika Vainio here. Hudson Mohawke brought the idea of “post-dubstep” to a wider consciousness and redefined the sound with a distinctive and destructive combination of hip-hop and dance music. He collaborated with Lunice under the wildly successful TNGHT project and produced tracks for some guy called Kanye West.